Huawei made significant progress with its in-house chipsets and after the flop that the Kirin 910 turned out to be in the Ascend P7, the following iterations were markedly better. Both the Kirin 920 inside the Honor 6 and the Kirin 925 that powered the Ascend Mate7 proved to be strong performers. Now with the Huawei P8 just around the corner, the Chinese company disclosed more detailed info on the Kirin 930 that is set to be the brains of the flagship smartphone, as well as the already announced MediaPad X2 7-inch tablet. 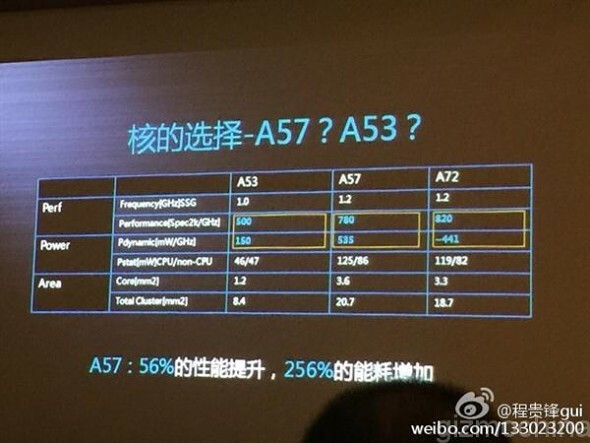 Contrary to previous reports, the processor inside the SoC apparently features a reworked version of the Cortex-A53 cores, dubbed Cortex-A53E, which is clocked all the way up to 2.0GHz. Four of these are used as performance cores in the big.LITTLE setup, while four of the vanilla 1.2GHz A53's take on more casual tasks. Huawei refrained from using the more powerful Cortex-A57 cores, because they provide a modest 56% performance increase versus a massive 256% increase in power consumption over the Cortex-A53, the company claims. Knowing how Huawei CEO feels on battery life, there's no surprise in the reasoning behind the choices made. We're yet to get our hands on a working device utilizing the new SoC at the office, so we'll reserve judgement until that changes.